Las Vegas is the gambling capital of planet earth. Sure, there might be better casinos in other parts of the world, but there is no gambling spectacle grander than the Las Vegas strip. If you love gambling, then you owe it to yourself to at least try Las Vegas once. Out of all of the hotels in Vegas, the Bellagio is probably the best. Besides being a five diamond hotel and the mainstay of the gambling super-corporation MGM Resorts International, the Bellagio has its fountains. Before we get to talking about the actual gambling hall within the Bellagio, I would like to take a comment to discuss the fountains. Perhaps the most impressive fountains the in the world, the fountains of the Bellagio put on a waterworks show every fifteen to thirty minutes. Before the show begins, there is simply a lake in front of the Bellagio in Vegas. Then, the music starts. They have a few different tunes that they will circulate through. When the music starts, the water shortly follows. The fountains shoot water up as high as 460 ft into the air. Those are the super extreme shooter nozzles. There are three other kinds of nozzles used to create different sized fountains. There are lights strategically placed underneath the shooting water to give it a glowing look. Also, some of the nozzles can move so the fountains seem to dance with the loud music. It is a sight to behold, and one of the most unique things about the Bellagio in Vegas. 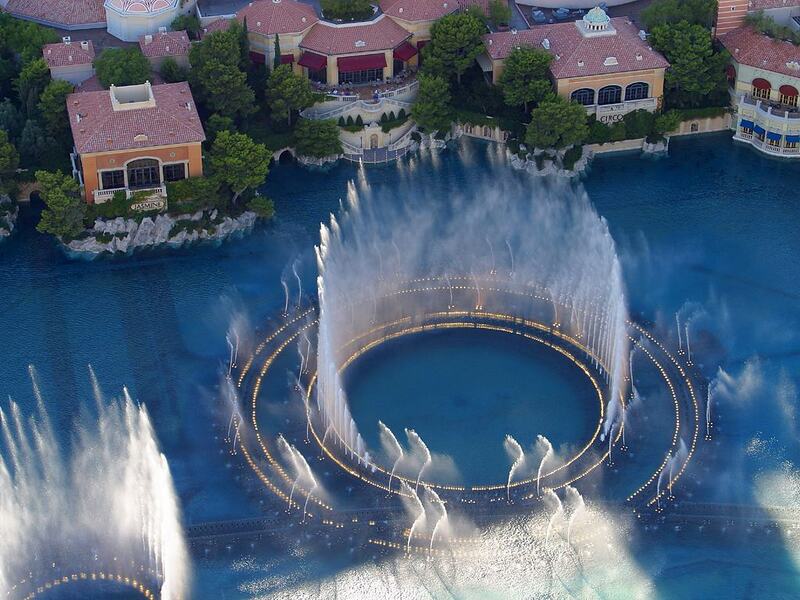 You can experience the fountains even if you aren’t staying at the Bellagio in Vegas. Still, they are fun to look at from a room in the Bellagio. If you get a room facing the fountain, you can actually play the music that accompanies the fountain’s show piped into your room. Then you can enjoy the show from the comfort of your room. Now, let’s talk about the gambling, the experience is a million miles from when you play roulette online in your own home. The Bellagio has the most prestigious gambling rooms in Vegas. This cannot even be refuted. Bobby’s Poker Room is a legacy of a room to play poker in. The World Poker Tour takes place at the Bellagio. Still, you’re probably not going for that. They also have the classic games that you expect a casino to have. The benefit of going to the Bellagio is that they do those games better than everyone else. Even the slot machines seem to be a little shinier than other places. That’s what happens when you’re in a five-diamond place. Things are just nicer. They also have games that you not have heard of before. The Bellagio isn’t afraid to try some of the new games out. This gives you a chance to play some of the games before they hit the other casinos. The Bellagio in Vegas may have been inspired by the Lake Como resort that is in Italy, but it has a life of its own in Las Vegas. We didn’t talk about a tenth of what they offer there. Still, I think the point of the matter came across. The Bellagio in Vegas is worth your time. Bellagio Robbery – Not the Cleverest Crime?